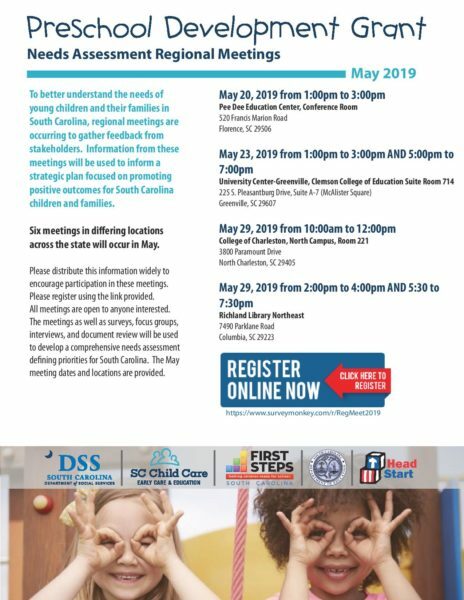 The South Carolina Early Childhood Advisory Council (ECAC) includes the directors of state agencies and government entities that provides services to young children including DSS, DHEC, DHHS, the Children’s Trust, the Head Start Collaboration Office and SC First Steps, which is the connector and convener of all early childhood serving agencies. Perform all other functions, as permitted under federal and state law, to improve coordination and delivery of early childhood education and development to children in this State. 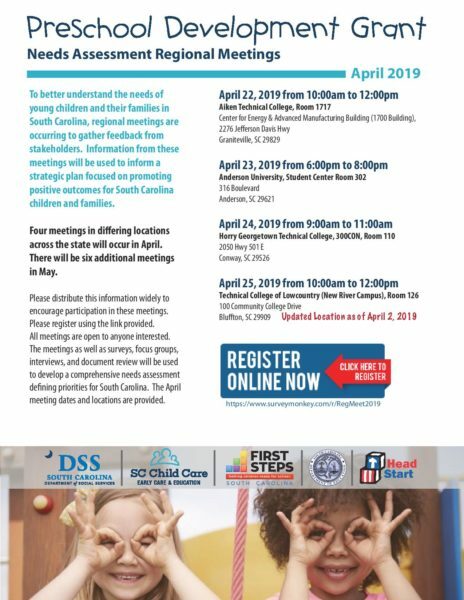 To better understand the needs of young children and their families in South Carolina, regional meetings in Graniteville, Anderson, Conway, and Bluffton have been scheduled for April to hear feedback from YOU. In addition, meetings have been scheduled for May in Florence, Greenville, North Charleston, and Columbia.